Here is a description of a free-range setup for Meller's chameleons. I hope it gives you some ideas for other species as well. Even if it doesn't thrill your chameleons it is guaranteed to worry neighbors, surprise guests, shock real estate agents, and discourage utility and appliance or delivery persons (well, you have assorted deliveries of weird insects and reptiles coming to your house regularly don't you?). First, there are dangers to consider. Loose chameleons could be lost in the house and end up getting stepped on, injured or eaten by other pets, or trapped in cold or dangerously hot areas. If you have children who leave doors or windows open you could lose one to the outdoors. It is harder to humidify the air or control temperatures in a room than a cage. Feeder insects can get loose and annoy squeamish household members. You'll have to be vigilant; closing doors to dangerous rooms or blocking off small openings along walls or behind appliances just in case a disoriented wandering chameleon blunders into them. Untangling a clutching, hissing chameleon from appliance wiring is NOT my idea of fun! They seem to grow extra legs and claws right then. All these problems can be dealt with, but you'll have to learn to think like a chameleon to provide a space they will stay in. What do chameleons want? Bright light and a high, warm basking spot attracts them, so design one they can easily reach. Give them a visually obscured perch away from snooping humans. Put moving food enticingly close. Bring rain. Once your chameleon has explored and settled into a place that meets its needs it will tend to stay there. When my first Meller's arrived I used a large wire cage designed for her. But, this cage measured 6 to 7 feet on a side, and I had to basically crawl inside it to clean or adjust anything (you fiddle around with a new cage setup for weeks like I do, right?). I don't particularly care for snagging my clothes on wire or setting knees or hands in fresh insect eater poop even if you do, and my female deliberately perched so far inside the cage it was difficult to spray her thoroughly. She also fought to get out, rubbing her snout and chin on the wire. The cage was irritating, ugly, and didn't suit the tenant. It took up much of the bedroom anyway, so I decided to get rid of the whole thing. With the cage frame gone and the houseplants set in literally the same space, she settled down amazingly well. When rescues two and three arrived the next year there was room for all and happily, they thrived. A small spare room or even a closet is ideal to do this in. Concerns about losing or squashing wandering scaly things can be dealt with by simply blocking the doorway with a smooth cardboard "chammy gate" you can step over. If you are trying to free range a chameleon in one part of a room you can put the plants in a cluster in a baby wading pool (finding a not-so obnoxious pattern or color is the challenge), a large stock tank or even a ring of boxes. The sides will need to be smooth and taller than the chameleon can reach. Lay a tarp or plastic sheeting on the floor and drape the edges over the boxes to create a smooth sided dam. I found that free-range chameleons who have space to roam and have their climatic demands met just don't wander very much, or if they do tend to be attracted to a few specific places. When one did stroll out into the house it seemed to be recreational and out of curiosity. They would toast themselves in a south window, patrol along a trusted path for intruders, and return to their space by themselves. Free-range chameleons tend to use perches predictably too. They were often in the same places at certain times of day. If you are still thinking like a chameleon you'll soon see the habit and take advantage of it. As Meller's chameleons don't really lick wet leaves or use drippers I ended up hand watering them daily. It was no more trouble to do this in a free-range setup and they were often easier to reach. You can create a sultry climate for them more easily by drenching the air of an entire room rather than trying to confine the mess to one corner. But, you'll have to watch closed spaces such as closets for mildew and mold. If the room is carpeted you should provide air circulation around or under any furniture, put everything you can up off the carpet (styrofoam packing forms or those little foam blocks carpet cleaning services use are great! ), and keep closet doors ajar so the carpet doesn't form rust marks, moldy spots or nasty smells. At first I tried keeping the closet doors shut, but moisture snuck in anyway so gave it up. I also found it helped to put any stored items in open crates or airtight plastic bins rather than cardboard boxes. A cardboard box full of stuff lying against a wall in this room is a great place for fermentation and mold experiments. I found that creating an "island" of forest in the center of the room worked best because I could walk all around it to clean, spray, adjust lights and plants, hog all the room's electrical outlets, and search for the tenants more easily. It was embarrassing to admit I couldn't always locate a 24-inch bright green and yellow striped lizard in there, but it happened. Most electrical equipment needed for chameleons needs timers, and we all know how plug-in timers are carefully designed to block the second (and usually needed) socket in wall outlets. The more outlets present the better, or you should just buy stock in power strip manufacturers. It's nice to have places to plug in air filter/room deodorizer units too. First, to keep the forest off my carpet I put a sheet of exterior grade plywood on low casters in the center of the room. The whole forest could be moved if needed. I covered this with an oversize piece of poly tarp or pond liner material leaving the excess loose around the sides. Next, I placed large potted plants on the tarp around the edge of the plywood and rolled up the excess tarp around the outside of the pots. This formed a sort of forest swale or dell in the center, but kept air moving underneath. 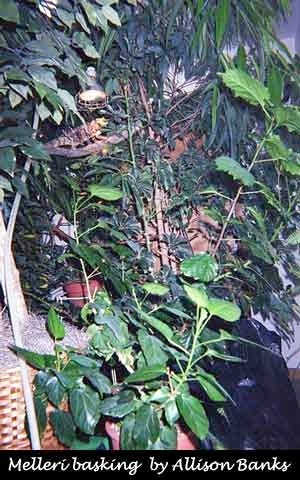 I used Ficus alli and large overgrown schefflera plants and added height to them by setting the pots on plastic crates. 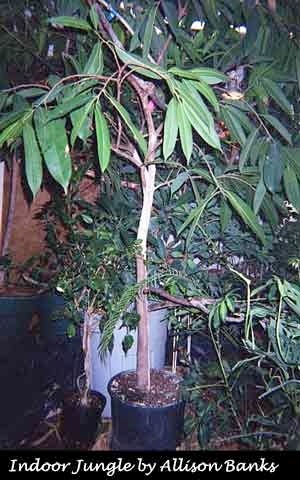 You'll have better luck finding this Ficus species at larger nurseries that sell ornamental trees and tropical foliage plants. Sometimes you can get a good deal on an overgrown lanky schefflera from warehouse home improvement stores too. Check moving sales for houseplants too. Many plants that folks don't want to move are huge! Citrus trees, palms and Hibiscus work, but will need bright focused light. I know we all laugh at those fake Ficus trees at Wal-Mart, but they are great for this setup! To give the chameleons travel paths around their forest (which also helps them decide to stay around) I connected the plants with natural barked tree branches held firm with light gauge wire. Now that the forest was set up I placed lights overhead by hanging fluorescent fixtures and basking spots from plant hanger hooks in the ceiling. Use mollies or expansion anchors to support the weight of longer fixtures. Most of my strip light fixtures are double aquarium hoods, as some of the cheaper shoplight fixtures don't handle ReptiSun bulbs well. For basking I used exterior halogen floodlights in adjustable clamp lamp fixtures so I could aim the light in strategic directions. 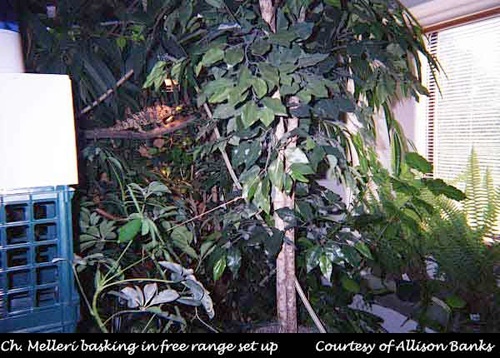 To make sure the tenants could get within 18" (46cm) of their ReptiSuns I arranged longer larger tree branches right under the bulbs and put the basking spots next to the ReptiSuns. The chameleons preferred climbing higher to bask anyway so this worked quite well. The odd bright glow filtering through dense leaves in the room windows made my local sheriff suffer major curiosity so I gave him a tour to ease his mind. He left knowing I wasn't producing controlled substances but convinced I WAS under their effects. Living in bone-dry Colorado meant major problems fighting low humidity. Spraying the forest could take gallons of water a day. Ah, but that tarp caught all the water beautifully! To slow down water evaporation I filled the "dell" with 6" of Cage Fresh paper pulp bedding. It absorbed runoff, was out of reach of shooting tongues (my big female could shoot her tongue about 2.5 feet), and functioned like a humid mossy forest floor. When it needed changing (an amazingly long time) it got spot cleaned or dumped in the garden. To help excess water drain to one spot I tipped the plywood sheet slightly and let the runoff collect in one low area of the tarp. I kept a bucket of large sponges handy to mop it up or ran a small portable water pump into the bucket. To bring rain easier I tried a series of indoor plant watering hoses and spray wands, but this room was not close to any plumbing. Snaking hoses through the house was a hassle and I noticed the chameleons reacted to the hoses lying on the floor. They spent much time flapping, hissing, and inflating themselves at the "snakes" unless I coiled the hose up in the bathroom after each shower. This bathroom had wonderfully inefficient, decorative faucets that leaked when used with a pressurized hose too. I guess Moen assumes no one uses garden hose indoors - how closed-minded of them! So I bought an Ecologic Technologies RainMaker Jr. misting system with a self-contained 5-gallon reservoir and threaded pressure tubing through the forest. The reservoir, pump, and timer sat in a corner of the room, and I draped the hose either from trees or from ceiling hangers. The nozzles were all aimed to fall into the foliage or center dell. A great device and worth every penny! It saved much time, kept the place tropical even when I wasn't home, and let my blisters and tendonitis from spraying 3 lizards for 20 minutes each 2-3 times a day heal. Interestingly, the chameleons began using the pressure hose for roosting perches and travel paths. Sleeping in this room was great for loosening head colds too. I found I still needed additional moisture in winter when the forced air furnace ran. At 9200 feet elevation during our single digit temperature winters this house hovered around 20% relative humidity if left alone. 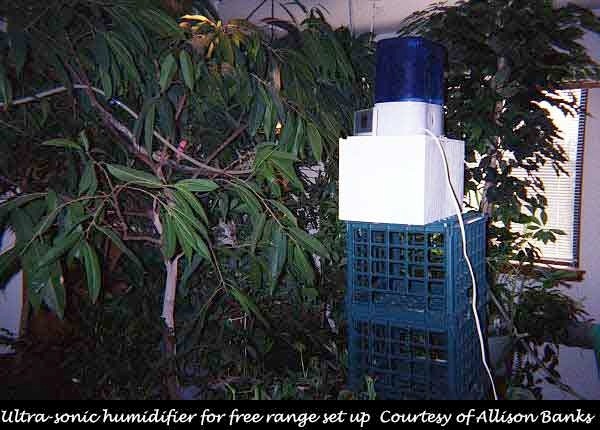 The very efficient RainMaker would flood the room trying to maintain 75-80% air humidity, so my next task was an ultrasonic humidifier for the forest. I stacked inexpensive plastic crates into a tower on one side of the dell and set a $40 Sunbeam model 696 on top. I aimed the mist with 2" diameter PVC water pipe up over the trees and watched fog pour down into the forest beautifully. A multiple setting lamp timer could control the humidifier as well. The last problem was feeding chameleons that didn't want me watching them eat. Another trip to Kmart provided several plastic storage boxes deep enough to keep crickets, roaches or superworms from escaping but large enough that insects moved a lot and attracted the diners. I threaded wire through holes in the sides and hung them in branches near favored perches (but out of the path of spray nozzles or you'll end up with insect soup). There was fresh gutload in the boxes, and any uneaten feeders were removed at night. Remember that chameleons often like to eat after they've warmed up in the morning. I put breakfast nearby. To keep the chameleons moving and hunting I changed the box locations around once they knew what to look for. I tried to place them where tongues would have to stretch to reach the food. This whole experiment worked well for Meller's chameleons and could be adapted to work for other species. Small shy and quick moving species would be hard to keep track of. Some males will wander outside an established territory searching for mates. Even in a large area like this I would be cautious about housing chameleons in groups unless you know their social behavior and signs of stress well. I probably spent more time solving design problems and observing the chameleons, but less time spraying and cleaning up after them. I really didn't have more escaped insects than I did using cages. But, I couldn't offer flying insects unless they were big enough for me to offer by hand. As for filling feed boxes, reservoirs, or the humidifier that would happen regardless. The misting system needed cleaning and sterilizing, but I found so much water ran through it daily there was little build up or stagnant water in the system. Hard water deposits eventually clog misting nozzles; so routine cleaning with vinegar is needed. I would take the hose down, coil it all in the reservoir and run cycles of bleach and vinegar through it using the pump every month or so. The biggest joy for me was watching established Meller's chameleons moving in a more natural manner through this room, showing less stress, tolerating human disturbance, and adding beauty and mystery to my life. Designing a bit of rainforest in my home was fascinating. Understanding habitat requirements of free roaming chameleons taught me so much more about them than housing them in cages.